the improvement techniques used by the organization are adequate or if maybe other or additional techniques are needed. 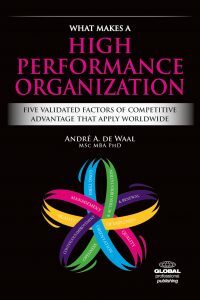 organization scores on the HPO factor Long-Term Orientation. Information comes available whether the organization is good enough in its dealings with stakeholders – and especially customers and suppliers – and specific training courses can be set up for strengthening the HPO characteristics in question.